Alexander House is the most haunted house in the state of Virginia. David Caine is perhaps the most well known debunk-er in the United States and as such, he is called in to stay at the house and write a book about it. The current owners are hoping that David will be persuaded into believing that the haunting is real, and that the resulting book about the matter will draw visitors/tourism to the home. Is David finally persuaded that ghosts and hauntings do exist? You'll have to read this to find out! My brief synopsis above doesn't do this story justice. Unfortunately, that's part of the problem I had with this book. There's a LOT going on-and to be honest? I thought it was too much. I loved the portions about the history of the house, the area where it's situated, and its former inhabitants-specifically Judson Alexander. I would have been happy with a book about him alone. I understand that this story has several layers and I respect what Jonathan Janz tried to do. However, I think the focus of this tale became too wide, what with tons of information about David's old girlfriend, his old friend Chris and Chris' new wife Katherine, the CRAZY neighbors down the way, the local sheriff, and I haven't even mentioned the siren yet! I was fine with all of it through about 2/3 of the novel, but by the last third it just got too busy for me. Yes, there were thrills aplenty and lots of surprises, but I felt like the denouement went on a bit too long, and tried to cover too much material. The writing itself though, was excellent, as I've come to expect from Mr. Janz. He created a tense and dense atmosphere-at times I felt I would surely suffocate from it. I also felt the characters were mostly realistic and while David Caine wasn't perfect by any means, I did come to care for him and I wanted him to pull through. This tale was imaginative and to restate, my only problem was that I wished it had been more focused. I seem to be almost the only one who isn't all-out raving about this story, so it's definitely possible that I read it wrong. Even with my complaint, I still enjoyed the heck out of THE SIREN AND THE SPECTER. You probably will too. 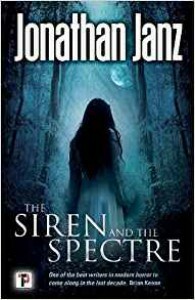 Jonathan Janz is always worthy of your consideration and if you decide to give this one a go, feel free to come and share your thoughts with me when you're done. You can tell me how wrong I am!